Vacuum seal fit:- No the container we own don’t come with a vacuum seal lid. 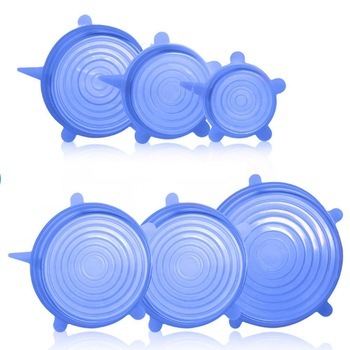 The silicone lids not only acts as a lid but also creates an airtight vacuum seals. Fits any shape bowls:- It is common to lose the lids to our container, or in some cases not having lids at all for them in the first place like cups, bowls, glasses etc. Do not worry VacuLid to the rescue. No matter what shaped container is it that you are trying to cover VacuLid has your back (square, oval, rectangular, round even a hexagonal bowl). Spill-proof seal:- Your VacuLids are spill and leak proof. Works perfectly to cover one freshly squeezed juice and prevent from going bitter to cover a can of cola to prevent it from refreshing fizz. Once sealed the lids ensure that accidental tumble of the glass doesn’t spill the liquid over. Keeps food fresher for longer:- Fresh food oxidizes very quickly, take a bite of an apple and keep it out for 5 min and you will see the proof. Your VacuLids can keep your food fresh 10 times longer with its patented Vacuum seal. Microwave friendly:- Trying to heat a bowl of dal you covered with Vaculids? No problem now take your food directly from the fridge to the microwave without even removing the Vaculids. Your VacuLids are microwave friendly and will not get damaged in the microwave. Food grade silicone:- All VacuLids are made with food grade silicone. You and your families health and safety are our top priority. Quick use and easy to store:- Using instaLids is quick and easy. Just in a sec pull it out any container press in the middle to create and vacuum suction and you are done. Needs less space for storage. Available in 6 different Sizes:- Silicon Stretch Lids comes in 6 different sizes to fit any and all size. Reusable:- A Silicon Stretch Lid would last you about 2 to 3 year. You can use it daily to cover different shaped containers. Faster Marinating:- Cover your marinated meats and veggies with Silicon Stretch lids for faster marinating. The vacuum created fastest the Marinating process upto 4 times faster. Freezer Friendly:- You now even use the Silicon Stretch Lids to even cover items in the freezer. Orders are shipped out directly from any of our many domestic & international warehouses and they will do everything they can to get you your order as fast as they can! Due to the popularity of our offers, please allow an estimated 2-6 weeks for your order to arrive to the USA (varies from product to product). Other countries can take an estimated 2-8 weeks (varies from product to product) due to distance traveling and customs. Please note, that due to the extreme popularity of our offers, these are only estimates.